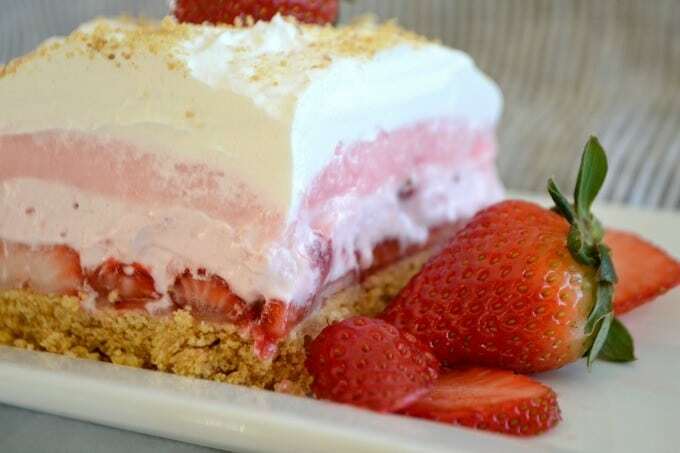 Strawberry Cheesecake Dream Bars – a graham cracker crust, fresh strawberries, a creamy strawberry cheese layer, strawberry creme pudding, topped with whipped topping. These are the perfect dessert to make when strawberries are in season! Wow, I can’t believe it’s almost the middle of April! I’ve been busy getting my taxes finished up and working on some behind the scenes of the blog which is why you haven’t seen me post for the last week or so. But I’m BAAAACK!!! And I can’t think of a better dessert to return with than these Strawberry Cheesecake Dream Bars. They are fantastic, especially if you’re a strawberry lover! They’re another NO-BAKE dessert that’s easy to put together. The bottom layer is a graham cracker crust that you pop into the freezer for 30 minutes to set, a layer of sliced strawberries, covered with a strawberry cream cheese layer, a strawberry creme pudding layer (that I neglected to photograph – I suppose I was just so excited about these bars that I forgot that layer! ), and then topped with a whipped topping. Now, for the whipped topping, you have a CHOICE! You can either choose to go the usual route and use Cool Whip OR if you really don’t like the stuff as I know a lot of you don’t (or if you live in a country where you don’t have access to it) then you can use my Stabilized Whipped Cream recipe which is just the right amount you’ll need as well! SCORE! See my daughter’s cat in the upper right? She so wanted a taste of this incredible dessert, too! These Strawberry Cheesecake Dream Bars are layers of graham crackers, strawberries, strawberry pudding, and whipped topping. It's the perfect NO-BAKE dessert for strawberry season! Set 5 whole strawberries aside for decoration. Mash 4 of them for the cream cheese mixture and then slice the remaining strawberries. Prepare an 8 X 8 baking dish by spraying it with cooking spray. In a medium mixing bowl, combine the graham cracker crumbs and melted butter and mix until well incorporated. Press into the prepared baking dish, and place into the freezer for a minimum of 30 minutes to set. In a small bowl mix the 1 1/2 cups milk with the package of strawberry pudding. DO NOT use the two cups as directed on the package. We want a firmer pudding. Refrigerate until ready to use. Place the cream cheese, mashed strawberries and confectioners' sugar into a mixing bowl. Cream until soft and well combined. Fold in 1 cup of the Stabilized Whipped Cream or Cool Whip and gently mix. Remove the crust from the freezer and completely cover with a single layer of strawberries. With an offset spatula, place dollops of the cream cheese on top of the strawberries and gently spread until completely covered. Spread the pudding layer over the cream cheese. Top with the remaining Stabilized Whipped Cream or Cool Whip. Top with the remaining whole and sliced strawberries, and sprinkle with more graham cracker crumbs. Refrigerate for at least two hours before serving to set. These are going to be a hit for your summer cook-outs, so you might want to double the recipe. Put it into a 9 X 13-inch baking dish to make sure there’s enough for everyone! 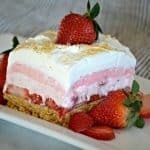 My Strawberry Cheesecake Dream Bars have been shared in Christy Jordan’s Southern Plate Weekly Meal Plan. Take a look and see what other great recipes have been submitted! 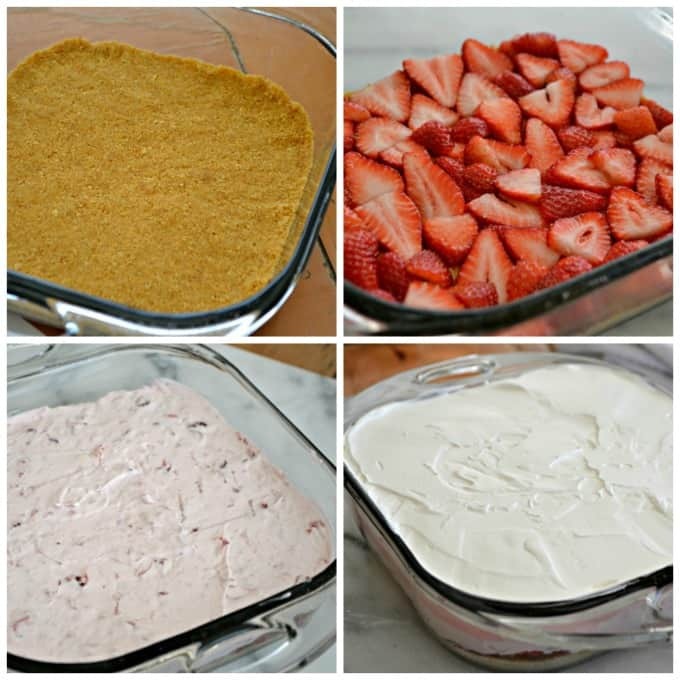 Take a look at these great no bake strawberry desserts from some favorite bloggers! I’ve shared these Strawberry Cheesecake Dream Bars at Tatertots & Jello. Take a look to see the wonderful recipes and ideas other bloggers have shared! I’d hop on a plane to try this. Looks amazing. I have to ask if the Strawberry Creme Pudding is the powdered type that you whisk in with milk? I hope so, that’s all we get here. The powdered version is exactly the one I used. It was the Jell-O strawberry creme pudding mix to be exact and can be found here on Amazon through my affiliate link: http://amzn.to/1SfsKNK. Oh, Aileen, I’m so very sorry to hear that! I used the 4-ounces of cream cheese in the recipe for the cream cheese layer, but the only thing I can think of that might have made it watery was if you used frozen strawberries instead of fresh. If they don’t thaw completely before putting the recipe together then the excess water from them would be a problem. Other than that, I’m at a loss. Also, did you you use just the 1 1/2 cups of milk or the two cups called for on the pudding box. Using the two instead of the 1 1/2 cups I called for would have made it more runny as well. I’d love to hear your thoughts and am sorry you were disappointed! I also made this for Easter and had the same issue with it being watery. I used fresh strawberries. Is it possible that the cool whip separated? Thelma, my apologies. I didn’t realize some things had been omitted. I incorrectly said a tub of Cool Whip as opposed to the 8-ounce because I was encouraging people to use the [Stabilized Whipped Cream recipe|https://www.365daysofbakingandmore.com/stabilized-whipped-cream/]. The recipe says at the bottom to “Refrigerate for two hours before serving to set.” I didn’t find a need to cover the dish, so you can leave it uncovered in the refrigerator. I’m glad you were able to find the Strawberry Creme pudding. I have been able to find it at Walmart stores. I hope everyone enjoys it tomorrow, it’s been a very popular recipe and my family’s really enjoyed it. I have to give you credit in the professional way you responded to the posters “complaints”. When I read her post I thought it was more than rude. I’m glad it wasn’t me that had to respond to that…I don’t have that kind of patience. Anyway, can’t wait to try this easy to make recipe. I’m sure my family will love it! Thank You! Enjoy the recipe. Many people love it and I hope you and your family do as well. Amen, Sharon! There’s no need to be curt or angry when asking a question. I, too, am very impressed with the tone of Lynne’s response. Professional and talented…quite a combination. Keep on posting because you have a huge fan base! ? Well said Sharon, very abrupt comment by this lady,, it doesn’t cost nothing for manners these days ? Best wishes from WIGAN, LANCASHIRE, ENGLAND ? Wow, wow, wow! You MUST be an angel….would NOT have been my response either good thing I did not see it till AFTER I had to change your LOVELY recipe alllllll by my lonesome to make it gluten free…ppls expectations are too high, at least ask politely, call me “old school” but my mom always taught us if you have nothing nice to say, say nothing at all??‍♀️? It’s an awesome recipe!! Thank you for the stabilized whip cream recipe I will never use Cool whip again! With summer and camping starting it is by far the most requested dish I am asked to bring. Judy!!! Thank you SO much!! I’m thrilled everyone’s enjoying it so much. You made my day! I plan on making it a few more times this summer as well since the family loves it so much. Yes, that Stabilized Whipped Cream is a life saver. While I do love Cool Whip, I don’t want to use it in every recipe that calls for it, so that recipe is a great substitute. Thanks so much for your comment! I also give you credit for your gracious replies Lynne! I love this dish, I can’t find strawberry pudding where I live so I put strawberries in my blender and add it to the vanilla pudding it works great. Thanks for sharing. Tracy, thank you so much! Many people have told me that they’re doing that because they can’t fid the pudding. I’m so happy to hear that you enjoyed it and came up with a great solution. I love no-bake and I love strawberries! Me, too, Megan. It’s the best of both worlds! The layers on this are so pretty! Can you add sugar to the strawberries? Also, can you use a different type of crust? Thanks, look good. Marge, I don’t think any sugar needs to be added to the strawberries as the end dessert is sweet enough, but you are certainly more then welcome to add it if you feel the need. 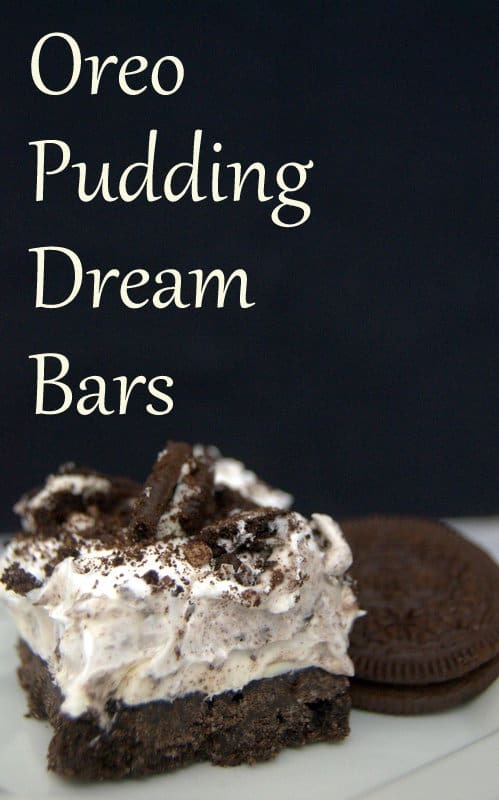 In regards to the crust, you could definitely substitute some Golden or regular Oreos as I’ve used in my other dream bar recipes. I used the graham crackers as I thought the Oreos might be too sweet. Could I use crushed golden sandwich cookies instead of the graham crackers? Pamela, you could definitely use the sandwich cookies in place of the graham crackers. I thought the cookies might be a bit too sweet, so opted for the graham crackers. Would love to know what you think when you try them! I wanted to forward the recipe to my email but I didn’t find a forward button. Could you please send the recipe to my email address? This looks so refreshing. After making do you put in freezer or fridge and how long do they need to set after making please? Irish, thank you for asking – I didn’t realize I’d omitted that from the recipe. The dessert needs to be refrigerated for at least two hours before serving. I’ve fixed the recipe to reflect that. Thanks! Where do you find the strawberry pudding, I have never seen it at a store. 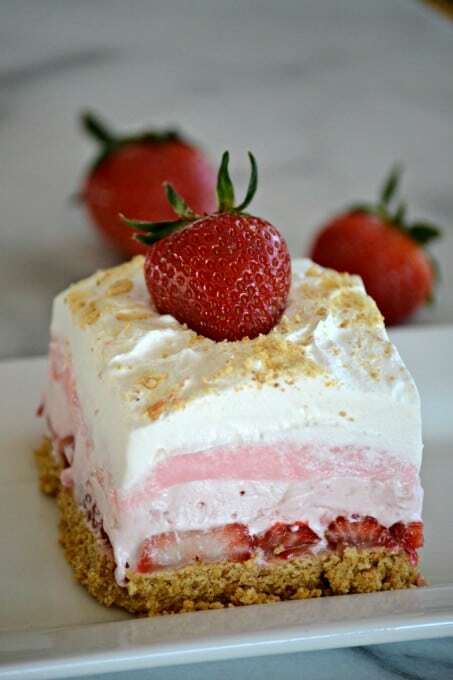 Yum can’t wait to make these, no bake strawberry creme bars. I love strawberries. Thanks so much, Pauline. I hope you enjoy them! I am going to try using the graham cracker pie crust already made and probably make 2 pies, maybe 3. What do you think? Elizabeth, if you double the recipe then you will be able to get two pies, maybe the third, but if only making the recipe as is it will just be one pie. Hope that helps! I found this at Comfortably Domestic – 1 8 X 8 will transfer to a (9 x 2-inch) deep dish pie plate. I have a deep dish pie plate so will use that. Thanks! A pretzel crust (crushed pretzels and melted butter) would be amazing with this. I think I’ll try it out! Great idea, Stacy! It sounds delicious! All of your recipes look delicious. Thank you so much, Patsy! Here’s the link to my Stabilized Whipped Cream. Feel free to use Cool Whip if you’d like. I just wanted to give people an option. I’m gluten free what can I replace gram crackers with? Hi! My 11 yr old daughter made this for me, for Mother’s Day (with a little guidance). It was delicious, we all loved it!! She used vanilla pudding in place of strawberry since we couldn’t find the strawberry, still delicious☺. Thanks!! Oh, Courtney, that makes me melt!! What a wonderful Mother’s Day present. Please give your daughter a HUGE hug for me! I’m so glad you all enjoyed them and thanks so much for letting me know! These look sooooooooooooo yummy ! 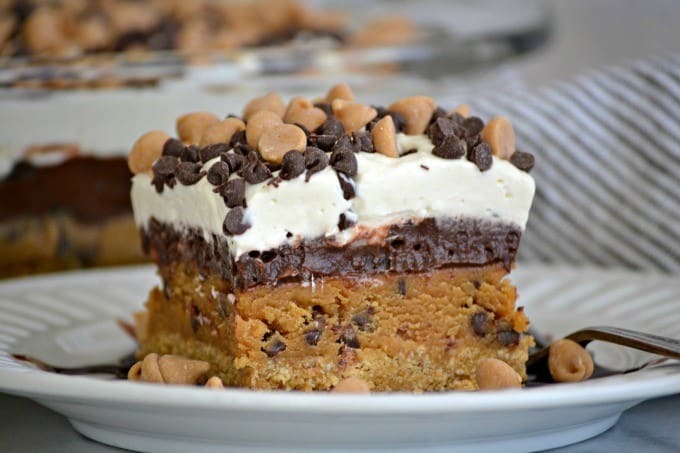 This looks so good I will have to see if the pudding is gluten free! 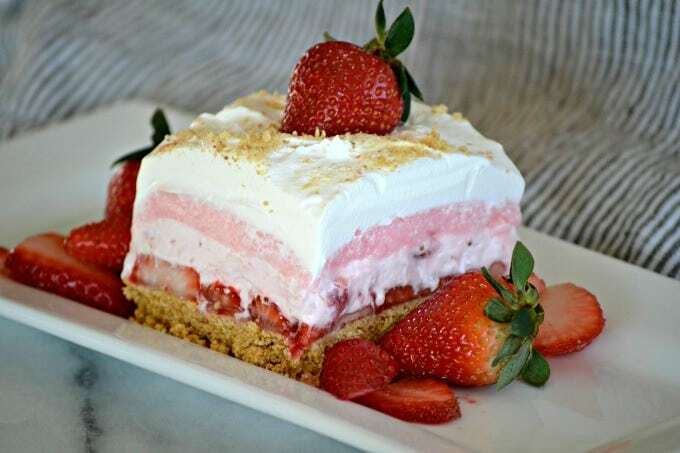 I would like to know about the creamy strawberry cheese layer. I love strawberries and cheese is one of my favorite foods. Could you please tell me how to make this layer? Thank you. I just found this site. It was shared on facebook. I located the complete receipt. Sorry for my lack of common sense. I like your receipts and am looking forward to reading your post that are in the past and the future. Thank you for the time you take putting these receipts together. No problem, Kay. You are very welcome. I appreciate your support and look forward to bringing you more. I hope you enjoy the dream bars. Since I could not find the strawberry cream pudding, I used the cheesecake flavor and added some melted strawberry jam and a couple drops red food die. It came out great! Ah, Linda I love the adjustments! This will be great for people who are unable to locate the Strawberry Cream Pudding. Thank you! Unfortunately, the pudding is no where to be found. I went to 5 stores including Walmart and I’m making tonight. I bought vanilla pudding instead an wondering if I should dye it red to at least to give it the color effect or add some strawberry jello powder. What do you think? Thanks! Oh, Nicole, that stinks! I’m so sorry that you couldn’t find it! UGH! I think the vanilla pudding will be fine with it. 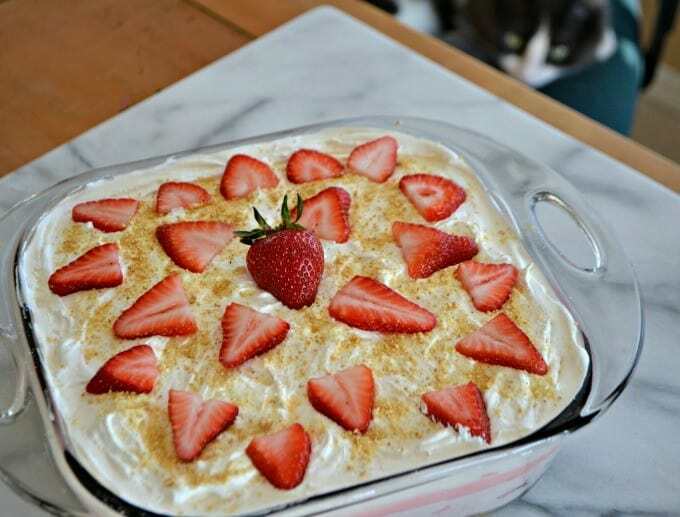 You’ll still have the flavor of the sliced strawberries and the strawberries in the cream cheese, so I think you’ll be ok. I’ve never added jello powder to a pudding before and don’t know how that would taste, so I wouldn’t want to suggest it and then have it ruin the whole dessert. I also found that the Strawberry Pudding was a bit sweet, so maybe the vanilla will be a nice balance. Please let me know how it turns out, I’d love to hear! Made this. Eating it tonight after our anniversary dinner. When I was cleaning up I tasted the spoon for the pudding. Hmm…not sure I will like the Strawberry cream pudding. THinking next time I will try cheesecake flavored…or even a chocolate pudding could be interesting. Cheryl, I honestly did not like the strawberry cream pudding by itself and would never eat it that way, but I thought it worked well with the other layers. I hope you like it. I think the cheesecake pudding would be really good with it, too! Thanks. It did turn out pretty good. Mine was in the fridge over night, but it was still pretty soft. Was hard to dish up. Might have done better in clear cups to eat as a parfait. Wonder if I should put it in the freezer a bit. I used vanilla pudding and pureed strawberries and mixed them into the pudding. That turned out amazing. I also tried the strawberry creme pudding mix and it wasn’t bad either. It is so easy and good! Leeanne, I’m so happy to hear that. Thanks so much for letting me know. I love the idea of the strawberries mixed into the pudding, too. I never would have thought of that one! MIX the cream cheese up first with the confectionary sugar, then add the mashed strawberries or you will have a lumby bumby liquidy mess!!!!! Otherwise recipe went well! Glad you enjoyed it, Diana. Sorry if the cream cheese mixture was an issue. So what is or where do you find Strawberry Creme [sic] Pudding? I looked at Giant Eagle and Save A lot and Rulli Brothers which carries a lot of spices and more exotic foods and could not find it to save my dessert. Of course after reading through all the comments I see someone else had the same issue and you steered them toward Walmart. Guess I’ll have to give them a try, and I really wanted to make this today for some guests! Yes, Mark, people I did find the Strawberry Creme pudding at Walmart, but many people have also told me that they’ve put crushed strawberries into vanilla pudding or strawberry jam in vanilla pudding and it turned out great. They’ve also just used plain vanilla and liked it also. I haven’t tried it with these substitutions, but it sounds as if others are enjoying the dessert with them just as much. I hope everything worked out for you! So I have the strawberry crime pudding made by jello and I see you say use one cup instead of two like the box says well my boxes come in 3.4oz so do I use one cup for all or one cup of milk for each box?? Tiffany, the box called for in the recipe IS ONE 3.4-ounce box. With that one box you want to use ONLY 1 1/2 cups milk. If you are doubling the recipe and using TWO boxes, you will use 3 cups of milk (1 1/2 cups milk for EACH 3.4-ounce box). I need help how many cream cheese do I use. It is me, not being able to figure it out. Please help. This looks so yummy. I did find some strawberry pudfing. Thank you for all your wonderful recipes. Barb, you’ll need four ounces of cream cheese. 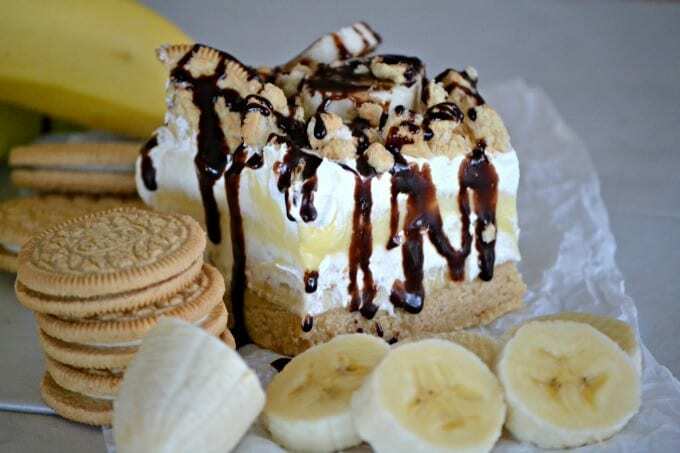 Just getting ready to make this wonderful looking dessert for my 22 year old grandaughter’s birthday. Do I use instant pudding not??? ? I’m making this dessert for Christmas dinner. I couldn’t find Jello Strawberry Cream pudding, but noticed a new one called Strawberry Cupcake ougging by Jello. I’m hoping it will taste as good. That should have said pudding, not ougging. Sorry! Why Does Google Post Advertisement Ads In The Middle Of The Recipe?? This Is Very Annoying And Cannot Seem To Be Able To Remove It !! SOOOO many pop-ups!!!! I finally gave up. I couldn’t get to a recipe, let alone read it, without being interrupted, and all that stuff means the page is constantly loading. What I could see looked really good, but it took me forever to look at three recipes. This looks delicious and I think it will be the perfect dessert for Easter – can’t wait to try it! i have just discovered your recipes, thank you. They are sounding wonderful.I just printed out two and see they have advertisements all through the middle of the printed recipe. Are all of the recipes going to print out with adds in them? Instant pudding or not??? ? 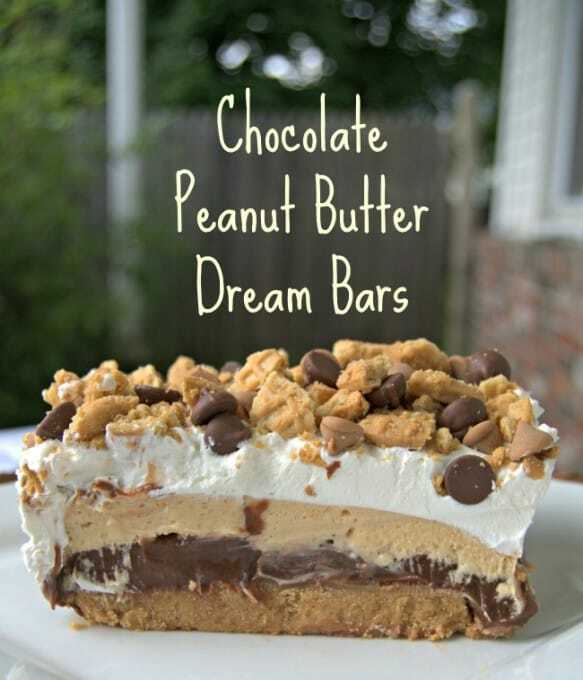 I did use instant pudding when I made these bars, so that is what is called for in the recipe. Hope your granddaughter enjoys them! Wish her a Happy Birthday for me! I agree with Sandi (above), nowhere in the recipe does it say INSTANT pudding, soi thank you for making it clear. Thanks, Jennifer! It is definitely hard not to! This is so perfect for summer! Delicious! Hand me over the entire pan of these and nobody gets hurt! LOL Yum! Is it one 8 ounce tub of cool whip or 18 ounces of cool whip used in this recipe? Don’t know why recipes don’t show the ounces amount in parenthesis- so its easier to read and understand the amount needed. Donna, it is one (8-ounce) tub of Cool Whip. Very Good this cheese cake recipe, I will probably make again. Really this cake recipe is very helpful for everyone. Thanks for sharing this nice cake recipe. V dnt hav graham crakers, can I use tiffany digestive biscuit fr the crust??? But wht ratio of biscuits n butter for crunchy base nt soggy. if you’re going to use digestive biscuits for the crust, use a food processor to make them into 1 1/3 cups of crumb and then use the same amount of butter as called for in the recipe. Using the exact amounts as called for in the recipe even though you are substituting digestive biscuit crumbs for graham cracker crumbs will still give you a crunchy base, not soggy. Feriha, I’ve never used anything but an instant pudding when making this recipe. That being said, you should still be able to use it without any issues. I would decrease the milk used for boiling by a half cup. So, if the directions on the pudding box say to use 2 cups of milk, I would only use 1 1/2 cups to that the pudding is a bit firmer. That way there won’t be any need to add gelatin powder to it either. Be sure to cool the pudding COMPLETELY after boiling it before adding it to the dessert, too! I am making this for the first time, I’ve never worked with pudding before. I found Junket Danish Dessert strawberry creme pudding/pie filling/glaze. The box says to boil the powder first, but do I use the pie filling directions or the pudding directions? Courtney, since I’m not at all familiar with the product, I don’t have any idea if it’s similar to the instant pudding I’ve used in the recipe and therefore can’t recommend using it. If you’d still like to try it, I would use only 3/4 of the amount of liquid called for on the box (if the box says to use 2 cups boiling water, only use 1 1/2 cups) so that it sets up firmly. Also, make sure to cool it COMPLETELY before adding it to the dessert. If it’s heated, you’ll just have a mess on your hands. I wish I could tell you more definitively! I’d love to hear how it turns out in case other readers have wondered about using the Junket product, too! I shopped everywhere and I can not find the Strawberry Creme Pudding; what can I use instead? You can use vanilla pudding or white chocolate pudding and add some more sliced strawberries to that layer. Also, some readers have added some strawberry jam to it as well.